Content marketing mainly combines the creation of the valuable and engaging content with search engine optimization and social media marketing. This also helps the companies to establish industry credibility, drive new sales and stay in the mind of the potential and existing clients and customers. Social media mainly plays the most significant role in content marketing. This is one of the key vehicles for distribution of the content. Moreover, email marketing and advertising, social media shares of the content are done through the popular sites like LinkedIn, Facebook, Pinterest, Twitter, Tumblr and Google+. The other platforms also allow some of the good contents to spread; word-of-mouth marketing is the modern version. With this, the spread of the content through social media should not be left by any chance. There are certain specific things that several organizations and companies can do for encouraging the social sharing of your contents. A successful content marketing strategy can benefit greatly from your business. If you are sharing the information that will never affect the sentiments of the reader, then it’s good. 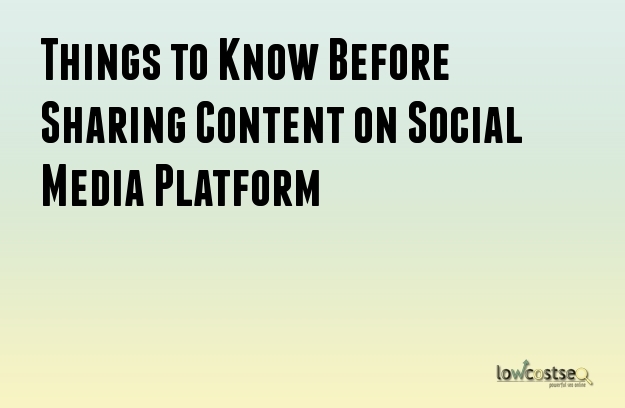 Following are stated some of the popular things which you need to remember before sharing your content on Social Media Platform. First, go through the article which you want to share with someone else. Are you interested in sharing other people’s content through social media accounts? Then, you need to check what exactly you are sharing before recommending it to your followers. It’s essential to publish the content which is designed uniquely and formatted on every platform. The format which works for the Google+ and Facebook may not work for Twitter. If you are using a social scheduling tool, then make sure of creating customized contents for every platform. Before you think to share your article in social media platform, you should have a complete and good knowledge about who is your audience, how to help them and what they care about. Your information should h help them to achieve their business goals. These are popularly known as social buyer personas. Please check the links before you share. If you are using a link shortening service, then it becomes easier to choose the wrong link. Take your time and double check it before sharing. When you are sending out the tweet with the article that’s written by someone else, you should use @ mention in order to give them credit which is due. If your author is not on the platform which you are using, you should cite the hosting site. You should make your audience know that you avoid these so that they won’t get into troubles. For your prospective clients and customers as well as your reputations, you should always proofread your text of your post in order to avoid errors of any kind. There are many tweets that have issues which you should avoid, like having two hash tags that’s placed very next to each other so that neither of them can work.